If flames and motorcycles are your thing, and Im sure they are or you wouldnt be here, then give these wraparound riding shades a onceover. 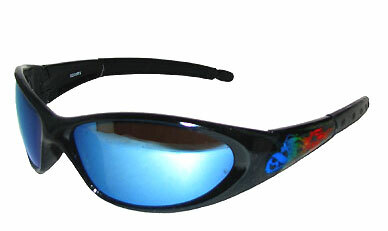 Ghost Riderz feature polycarbonate Blue Ice mirrored lenses, are infused with UV400 ultraviolet protection from the suns harmful rays, and feature a full wraparound wind sealing desighn to boot. Not only that, an added benefit is that people cant see your eyes or where you might be looking... if you catch my drift. Ghostriders... a nice pair of wraps I kid you not!!! Rubber Ear Grips Keeps 'em on yer head!